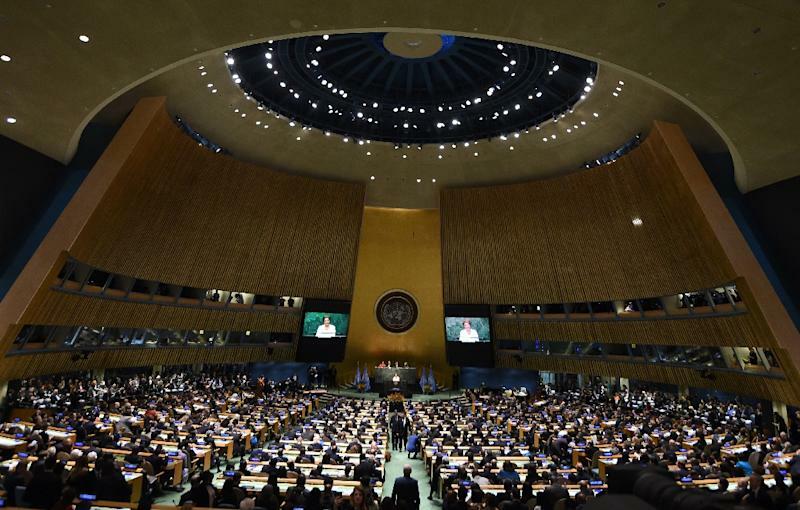 As many as 175 countries, including India, China and the US, signed the historic Paris Climate Agreement at United Nations Headquarters in New York marking a significant step to combat global warming. Environment Minister Prakash Javadekar signed the agreement in the UN General Assembly hall at a high-level ceremony hosted by UN Secretary-General Ban Ki-moon on the occasion of Earth Day (22 April). Historical agreement : It was for the first time in the history that such a large number of countries signed the agreement in a single day. The previous record for the most countries to sign an international agreement on one day was set in 1982, when 119 countries signed the 'Law of the Sea Convention'. The agreement will be open for signature for one year - till April 21, 2017. The ceremony was attended by heads of governments, foreign ministers, corporate leaders and artists from across the world. The agreement will come into force once 55 countries representing at least 55 per cent of global emissions formally join it. In the agreement, all countries agreed to work to limit global temperature rise to well below 2 degrees Celsius, and to strive for 1.5 degrees Celsius. China, the world’s biggest climate polluter, announced it would “finalise domestic procedures” to ratify the agreement before the G20 summit in China in September. The US and India, the second and third biggest emitters, also reaffirmed their intention to approve the deal this year. Safeguards the interests of Developing Countries : The agreement acknowledges various development initiatives of the countries and rights to development. It provides a harmonized path that synchronises environmental protection and growth. Sustainable Development: The agreement highlights the importance of sustainable development and consumption of resources in efficient manner so that ‘climate justice’ is not compromised at any phase of development. Financial support from Developed countries: The agreement, calls on nations to scale up their level of financial support with a complete road map. To achieve the goal of mitigating climate change Developed countries will provide 100 billion dollars annually to the developing counterparts beginning in 2020 and it would increase with time. The financial support would be used for providing appropriate technology and capacity building support. Implementation of the Convention: This is for the first time that whole world has came together for the cause climate change. Every country would make significant effort to combat the gobal temperature rise. Comment : The Paris deal is the most ambitious climate change agreement in history. It established a long term, durable global framework to reduce global greenhouse gas emissions as 195 countries will work together to put the world on a path to keeping global temperature rise well below 2 degrees Celsius. Which of the following parts/ provisions of the Indian Constitution cannot be amended?